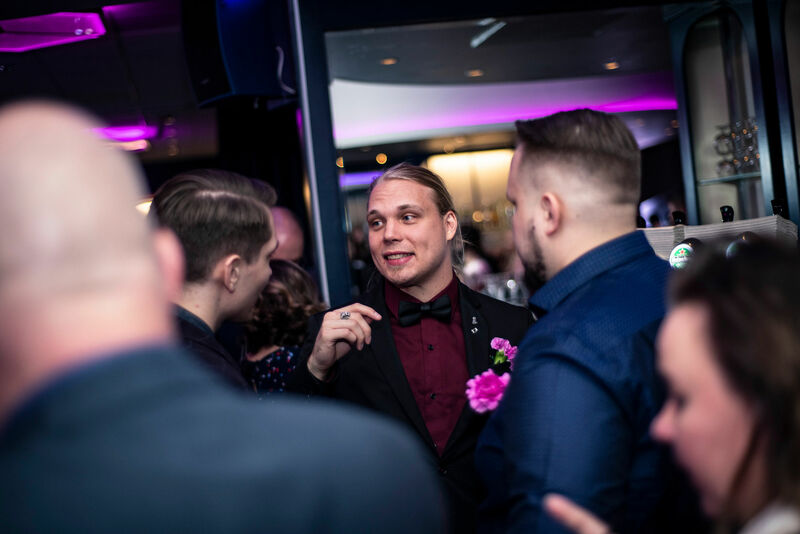 When Qvik was founded, Tuukka Puumala, Lari Tuominen and Elias Aalto were convinced that, together, they could write better software than anybody else. The twenty-something visionaries saw many pitfalls in their jobs at the time, and these pitfalls they could avoid in their own company. “Well, pretty soon we found out that we weren’t the best developers in the world after all. Not by a long shot”, Tuominen says. “And it turned out that running your own company was no cakewalk either”, Puumala chimes in. In the early years, the partners often worked late nights and over the weekend, but their faith in what they were doing and trust in each others’ abilities was high. From the start, Qvik’s product development was driven by the users and user experience. In his speech, our CEO Lari shared some beautiful memories of Qvik’s early days and journey to where we are today. After the speech, Tuukka announced that he and Elias would soon tell us what really happened. “That enthusiasm, the feeling that this was going to be really great, gave us the energy to keep going in the early hours. From the design up, we wanted every product to be cooler than what was on the market”, Puumala says. On Fridays, the whole company went for after work beers together, the cheeseburger wrappers kept piling up, and work didn’t feel like work at all. Those early days were characterized by a spirit of living in the moment. 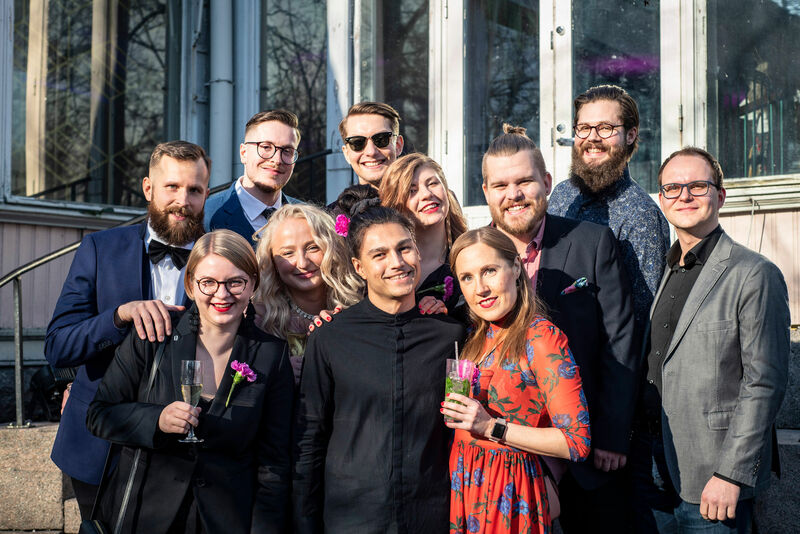 For example, on a warm spring Friday, somebody got the idea that everybody should go for an urban vacation next week – and that’s how the first Qvik trip was born. There is nostalgia in the memories, but the trio does not miss everything from those early days. 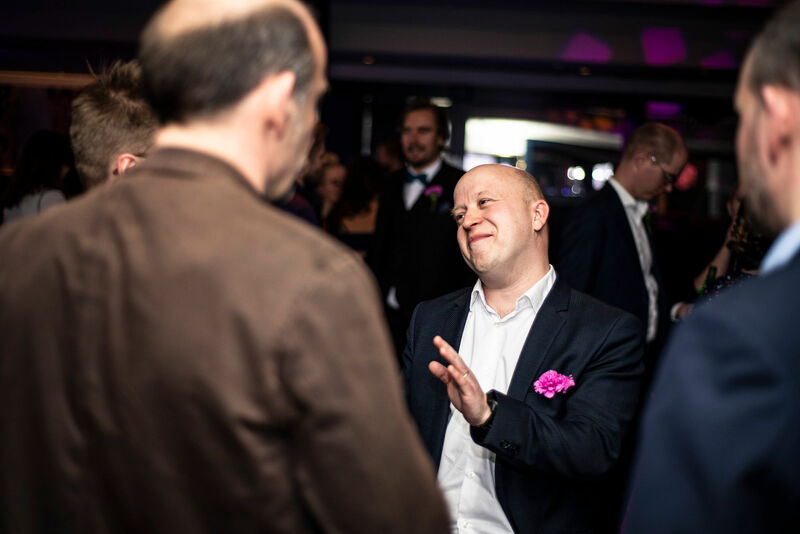 There’s the head of our Head of Design, Matias Pietilä, who has been with Qvik since the early stages. 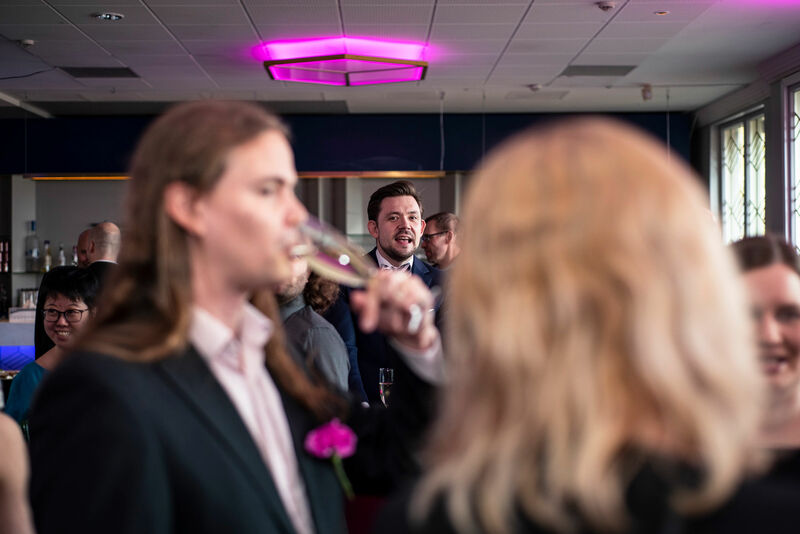 Pertti Kröger, the first employee hired by Qvik, is sipping his bubbly at the front. Qvik has grown organically, that is, without outside financing. There have been plenty of financiers and arrangements on offer, but Qvik has always wanted to keep hold of the reins. Acquisitions are always risky, particularly when all parties are not familiar with each other. When you are no longer in charge of your culture, anything can happen to the work atmosphere. Of course, many companies have also implemented arrangements with no detriment to the mood at the office. 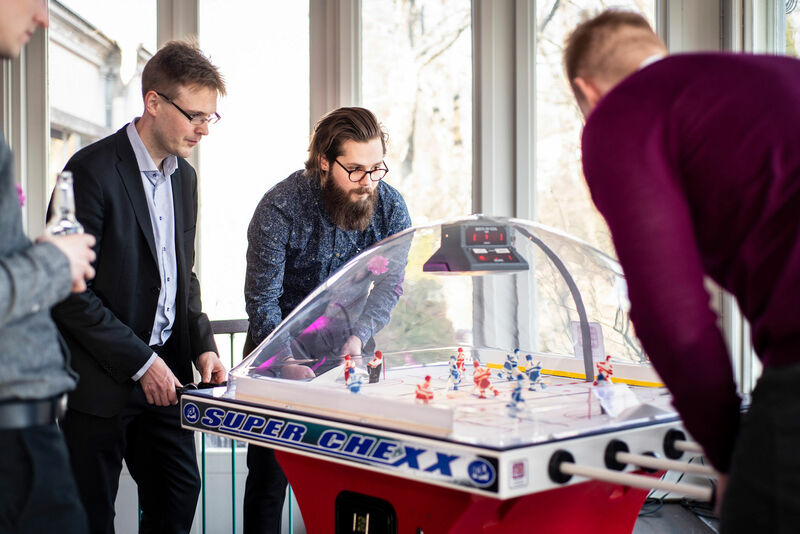 At Qvik’s birthday party, we cut back on the pomp and focused on what’s really important, like table hockey, karaoke and Atari games. Acquisitions can also lead to an obsession with growth. If growth is the only thing that matters, you can end up sacrificing everything from financial metrics to projects and work atmosphere. 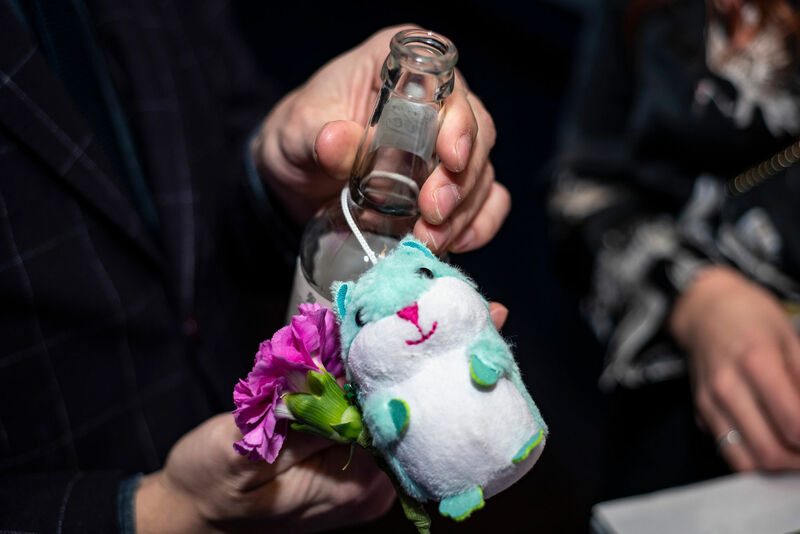 Qvik’s office mascot, Marsu “Guinea Pig” I, was naturally also there. An Arctic Fox was also spotted on the dance floor. From the perspective of culture and people, it is fortunate that Qvik has been able to grow like this. Qvik is still a company where the employees are also good friends. We are still able to get all excited about things and have retained the right degree of naiveté. Maybe we just get excited about slightly more sensible things now and are able to think about the next step in a more realistic manner. In Qvik’s culture, it has always been natural to befriend your colleagues and also spend your time off with them. “But the fire is still there. I love seeing that also in people who have joined us years after the founding of Qvik, even just this year”, Puumala says. We listed the four most significant changes in the industry since the founding of Qvik. 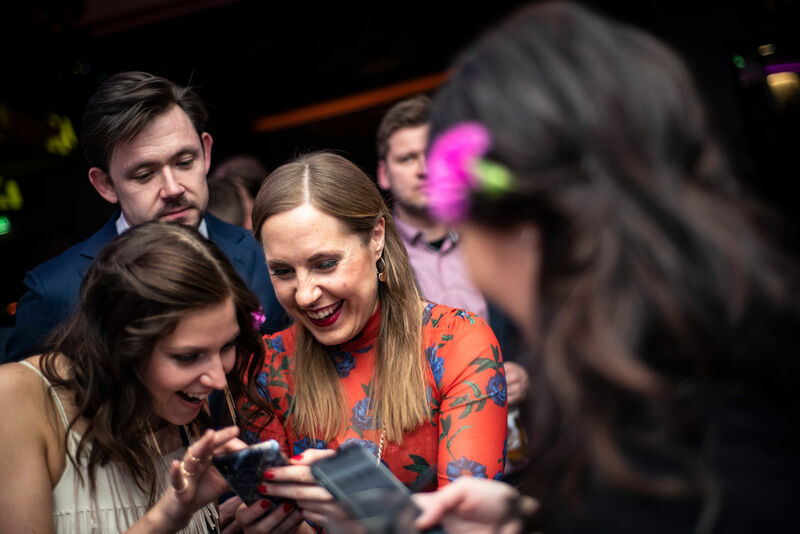 And to give ourselves one more pat on the back, we’d like to note that many of the things that were evident to Qvik in the early days have later become mainstream in the industry. 1. Mobile has become mainstream and mobile development more sensible. “At first, mobile development was like, mobile is cool, and there’s this cool new thing called an iPhone, and we should think up some more marketing-oriented stuff for it now. Even we ended up doing one or two applications that didn’t make a lick of sense, even though the products themselves turned out beautiful”, Puumala says. The impact driven thinking had not broken into mobile development yet, and the main thing was getting downloads for your app. Customers aren’t prepared to pay very much for products like that, and Qvik’s work too was a patchwork of little projects compared to what we are doing now. “Today, working with mobile is a lot more focused and sensible. Products are steered by measurable results and created as part of a wider digital strategy, instead of just churning out random applications”, Tuominen says. 2. The user has taken center stage in design. “Fortunately, the importance of design and the user experience has increased. They were some of our founding tenets, and our design work has evolved with the growth of our company since the beginning. Many tech and consulting companies only realized this a bit later and ended up buying design agencies”, Tuominen says. At Qvik’s Tallink design department, Mirkka Ollikainen and Marjo Kujala like to use the Finnish word “mielissään” a lot. That is something like “pleased” in English. They are clearly mielissään about something here. Design thinking has also evolved and is now closer to service design. At first, many of our customers had a partnership with a design agency with which Qvik then cooperated. “That type of design was little more than sketching user interfaces: we received a Photoshop file with design’s vision for the product, that was created without any service design process or customer involvement. Today, design begins with the user, and user testing begins before the first line of code is written”, Puumala says. 3. The public cloud has revolutionized the tech field. “In the field of technology, the spread of the public cloud is one of the biggest changes. Through the public cloud, like Google Cloud and AWS, you can buy mega computing power and the latest innovations by the second, without having to invest in the hardware yourself. This way, even the little fish can make use of data and achieve something big”, Tuominen says. Here you can see some sharp Villes, such as senior developer Pelkonen and designer Brofeldt. Qvik’s cloud service development originally started with the enthusiasm of a couple of employees. Tuominen and Puumala were not particularly familiar with the field, but said OK to the proposal of setting up a cloud division. 4. Workplace culture has become more important. Work practices have become more reasonable. The culture characteristic of the startup scene has spread to larger companies, and expressions such as “agile development” have pretty much been done to death. If this were a stock photo, it would be called the Key to Success. 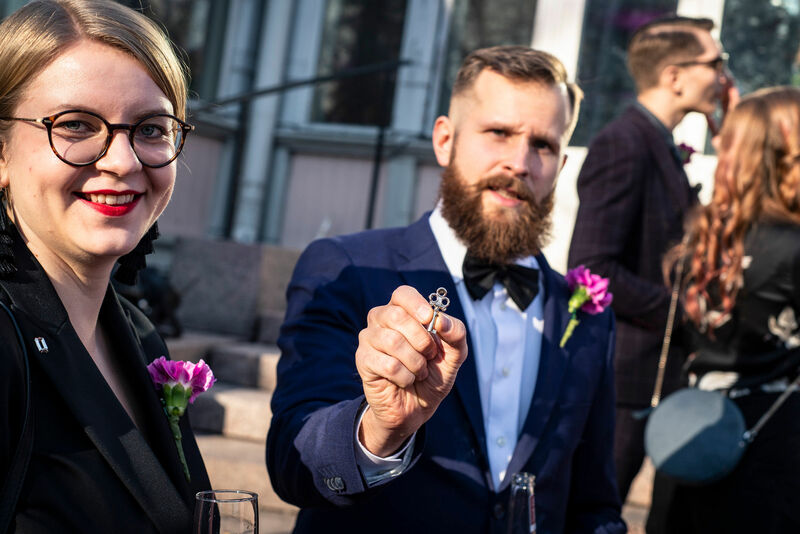 But this is a shot from Qvik’s party, and that’s our designer Lauri Makkonen, holding some weird little key. The technology industry has also become more diversified in the last decade. Wanna be a part of Qvik’s journey? See our open positions!